The subversive messages started going around on Facebook in October. It was all very hush-hush, in the spirit of the resistance that characterizes such movements in France. The gist was this: Stop! Enough already. The French people are already taxed to death. It is time to stand up and say no more. Ça suffit! In protest against the latest round of price hikes at the gas pumps, 60% of which is tax, we were urged to get out our high-visibility vests on November 17 and join the protests and blockades to bring the country to a halt. So was born the popular movement of ‘les gilets jaunes’ – the yellow vests – in France. The name is a natural as every French vehicle is required to have one of these on board. And then, a couple of weeks ago, this video went viral. Its author, Jacline Mouraud, has become the unlikely, sweet-faced spokesperson for the movement. Or perhaps not so unlikely. Because she speaks a certain amount of truths, simply but with heart. And there is no denying that the Macron government seems to be tone deaf to the outrage of the working poor, those who earn the minimum wage of around 1200 euros net per month (9 EUR per hour). As she asks the government: What are you doing with all that extra money from our higher gas prices, the radar traps, the ‘contrôles techniques’ on older vehicles? Other than buying new dishes for the Elysée Palace or updating your swimming pools! She also spews quite a bit of misleading information – fake news, in popular parlance. There is no ‘carte grise’ or license for bicycles, nor a government plot to get us all riding around on trottinettes. But it has got a lot of angry French people out to protest since Saturday. Sadly, two people were killed and over 600 injured, among both protesters and the police. And it ain’t over yet. The higher prices for gas, especially for drivers of diesel vehicles of which the poor represent the majority, is just the tip of the iceberg. The ‘ras le bol’ (sense of being fed up) among the French goes beyond the government’s carbon tax to compensate for new, more ecologically friendly, modes of transport. Even the poorest taxpayers understand the need to cut pollution. It is the fact that people here feel their purchasing power diminishing, that seniors can no longer count on their pensions to cover the cost of living, that working people cannot make ends meet. It is a context that is popular and political and fired by a sense of social injustice. I hear rumblings of student protests and if that happens, well…who knows? What do you think about the ‘yellow vests’? Something has changed for me since the latest terror attacks. Something subtle, yet disturbing. It’s as if the shock and horror of so many innocent lives lost has diminished a notch, as if somehow this has become the new normal. Paris. Brussels. Nice. Orlando. Manchester. London. Yet how can we accept terrorism as the status quo? The same way the world has grown immune to stories about the migrants drowned at sea. Just as America accepts the hundreds of lives lost each day to guns – ten of which are children. And not so different from our increasing immunity to the latest lunacy of its president. It is becoming harder to separate the tragic from the comic. Perhaps we have become blindé. Like the armoured vehicle shown here, known in French as ‘un blindé’, we have toughened our exterior. I read that this model, called Titus, was being tested in Paris to transport security forces following the attacks at the Bataclan. It is tough but moves quickly, and can safely carry 13 men and wounded under fire. It is not uncommon to see heavy artillery on the streets of Paris. When I first came to France in 1986, Paris was the midst of a wave of terrorism. A bomb went off in a popular store called Tati on Rue de Rennes, killing seven people and injuring 50. Suddenly there were machine gun-toting military and army tanks on the streets. I was frightened and perplexed. Were we at war? I learned that for the French it is vital to have a show of force at such times, to see that the government is doing something to maintain order — whether to control student riots, to bring an end to massive strikes and demonstrations, or to protect the people from acts of terror. While I was terrified to see so much visible weaponry, most people found the police presence reassuring. Yet, how can you protect anyone on the street from a maniac behind the wheel of a van? From someone with a hammer or a knife who takes another by surprise? You can’t, of course, and that is why we must grow tougher. Learn to live with the threat. Keep calm and carry on. Not immune. Not blasé. But tougher none the less. ‘Se blinder’ means to become used to a threat, to toughen up, thicken one’s skin. It also means to go on a bender, to get rip-roaring drunk. In a weird way that makes sense. Either way, we are feeling less pain. So what will it be: get tougher or get drunk? Do you feel you have become ‘blindé’? A bit of comic relief for a world gone mad. Crazy. Fou! This song was released in 1990 and became an instant hit on the French music charts. Never has it seemed more timely than it does today. The world is indeed a crazy place. Is it not ‘fou’ that Brits are preparing to vote in a referendum that could forever – or at least for the foreseeable future – change the face of Europe? Isn’t it ‘fou’ that a Donald McTrump (at least that’s how I always think of him given his all-American menu, crazy wig and clown-like behaviour) is seriously a contender to lead the free world? Can we even talk about a free world anymore when people of all genders and orientations aren’t safe at a nightclub in the land of Disneyworld? At a concert in Paris? In the editorial offices of a satirical magazine? Even police officers, the very people who are meant to protect us, in their own homes? Add to that the particular insanity and violence of football hooligans here in France during the Euro 2016. The world’s gone mad and there are times, especially this week, when I despair of it ever becoming sane again. What’s worse, there doesn’t seem to be a damn thing we can do about it. It’s a crazy old world, mes amis. So we might as well sing, dance, and celebrate the crazy in us all. Tears and other public displays of emotion are not characteristic of the French. But while they may not smile and laugh all the time that does not mean the French don’t feel things. Deeply. Marianne is in mourning. For three days the nation will wear black, mourn its dead, weep for so many innocent lives lost in Paris on November 13, 2015. There will be anger, there will be sadness and regret. These feelings will erupt only occasionally into tears and shouting. Mostly, there will be small acts of kindness, like those of the strangers who took in blood-stained victims from the street and let them shower, who offered food and shelter for a few hours until the siege was over. Like the gesture of this spontaneous embrace captured when shots last rang out in Paris. There is no accordion music playing in the streets of Paris — not today or any other day. Paris is not the romantic city of postcards, of Hollywood movies, although if you spend any time there you will experience moments of pure magic. Perhaps you will love its joie de vivre all the more for the fact that it takes place against a backdrop of restraint. I am not a Parisian but a little piece of my heart will always be there. We lived in Paris for most of 1986 before getting married here. Our apartment was in the 7th arrondissement, just a few blocks from the Eiffel tower. It was a short time but one that left an indelible mark in my memory. Paris is indeed a moveable feast. There was a wave of terror attacks in Paris that year. As a Canadian abroad, it was the first time I had encountered machine-gun toting police in the street. We lived with what became for me the constant fear of bombs in the metro, in the cinemas and the shops. I learned the French word for terrorist act – attentat – and became familiar with the identity checks and security measures of the plan ‘Vigipirate’. Like many of my compatriots here in France, I have felt numb since waking to the news of Friday’s attacks. Perhaps it was to be expected. Since we reeled from the cold-blooded murders at Charlie Hebdo in January, there have been many reported terror attempts – fortunately failed. Lest we forget, France is still public enemy number one of Daesh. And like many of my fellow countrymen, I wonder why. Why are we fighting a war that cannot be won, at least not with bombs? Why can’t we fix our own broken social system so that French-born Muslims provide less fertile ground for extremism? It’s complicated and I don’t have any answers, other than the obvious one: life is precious. Any life lost to evil, whether in Paris or Beirut, must be mourned. Marianne is crying but it is not out of self pity. Let us shed a tear for Paris, and for her victims, but no more. The world needs light and undying love and for this reason Paris will continue to shine. My earliest memory of Pierre Elliott Trudeau goes back to 1967, the year before he became prime minister. I was ten years old that year, and Canada was celebrating its first 100 years as a country. We were a young country, everyone said, although it didn’t feel that way to me. We celebrated Canada’s centenary and being 20 million with songs and parties and a nascent sense of nationalism. Change was in the air. The Beatles were on the radio and my mother sat glued to our black-and-white TV, just as she did whenever anything big happened in those years: when President Kennedy was shot, when the first man walked on the moon, or when the race riots exploded south of the border. Trudeau came on the scene as Canada was grappling with issues of identity: who were we, anyway? Were we English, were we French, were we British or American? Perhaps we were a bit of all those things, but somehow when Trudeau became our prime minister, we figured it out. We were the truth north, strong and free! We had our own flag and we learned how to wave it. And we had a young, attractive PM representing us abroad. He was a bilingual French Canadian, and an intellectual. He was born in Montreal but he had all the glamour of the French. He was also a bachelor, and a bit of a ladies’ man. The women, including my mother, all swooned. Trudeaumania was born. My father scoffed, until someone told him he looked like Trudeau. Trudeau reportedly had affairs with many famous women, including a personal idol of mine, Barbra Streisand. Then he married a woman thirty years his junior, a flower child called Margaret. Canada was shocked, Canada was thrilled. The couple produced three children while Pierre was in office. Sadly, the marriage did not last and Margaret went off the rails before remarrying and disappearing from public view. She was famously photographed dancing in Studio 54 when the Liberal party lost in 1979. In his years in office, Trudeau stitched together the fabric of our bilingual and multicultural identity. He managed to calm the Québec sovereignty movement, although he did not make friends there, and made us proud with his stand on international issues. Like most of my fellow countrymen, I am happy to see the last of Harper. He was boring, polite and oh-so Canadian. I could never remember his name. Outside of Canada, there was no reason to know it. We Canadians are not the proud, flag-waving types; ours is not a celebrity culture like our American cousins to the south. To some extent, Pierre Trudeau changed that. Now, Justin is set to continue what his father started. So forgive me for waving the flag for a moment: Long live Trudeaumania! 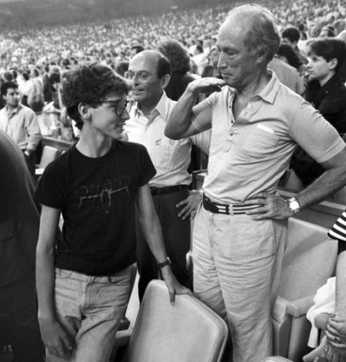 What are your memories of the Trudeau years? Any thoughts on Canada’s new PM?